The purpose of GrantBenefit is to provide guidance, ideas, resources and practical tools to help community foundations and other funders begin to assess their benefit to the community. In an increasingly complex philanthropic environment, the ability to demonstrate that your foundation is achieving results is critical. In developing this Web resource, we found that achieving and demonstrating grantmaking benefit requires both maximizing internal foundation performance and increasing external value. This Web resource therefore focuses assessment activity on two major areas: making a difference with your grants in the community, and making good grants through appropriate strategy, good governance, and operational effectiveness. GrantBenefit is written from the perspective of a community foundation, regardless of size, that is currently making grants or is planning to make grants and wishes to increase the impact of its giving. 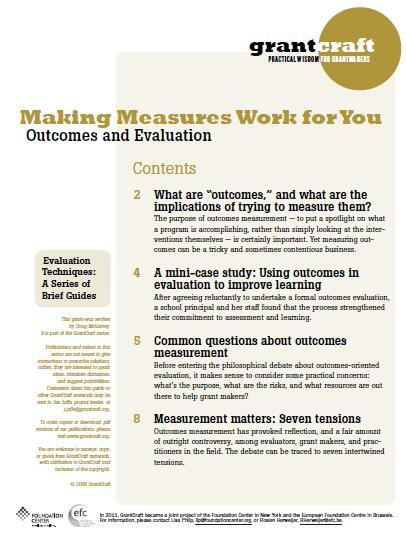 Other grantmaking bodies will also find this resource helpful in developing ways to assess the difference their grants make and how to increase their grantmaking effectiveness.